Join us for finger food, wine and networking from 6.15PM for the 7.00PM event – don’t be late! 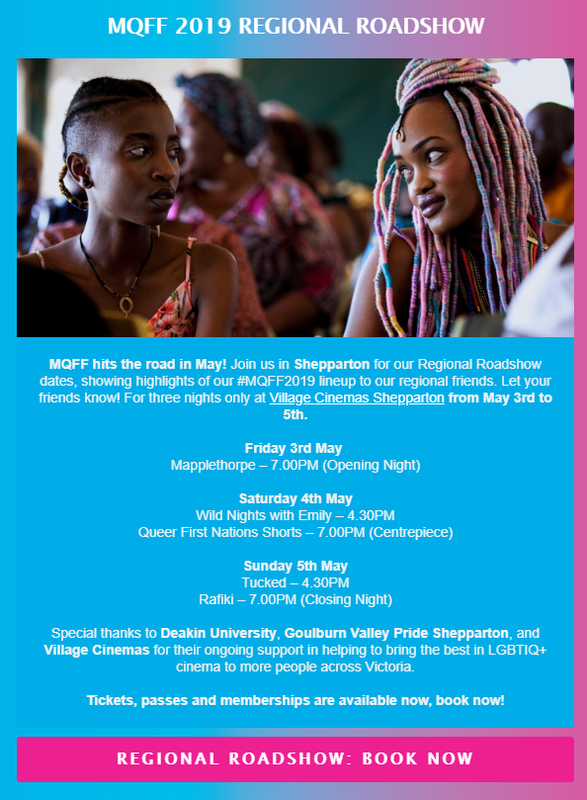 Funding support provided by the Victorian Government – Equality Branch, Department of Premier and Cabinet and Shepparton Festival. 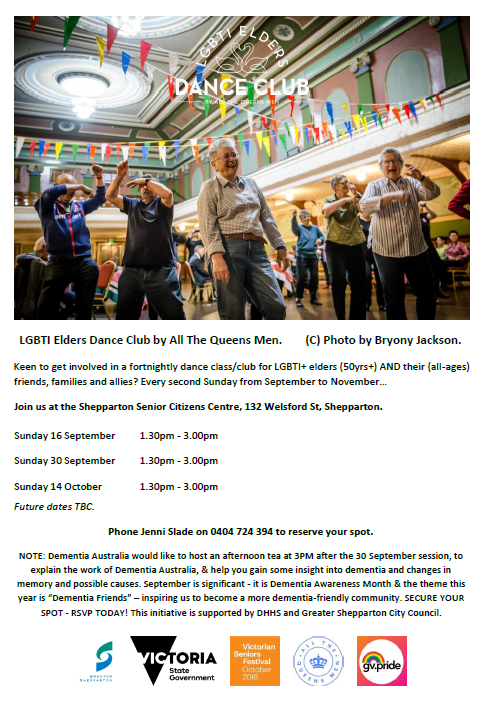 Jump on the 22-seater bus departing Marungi Street, Shepparton Library on Sun 3 Feb @ 7.00am sharp (returns approx. 7pm). Facebook event. $40pp for members ($25 concession), $50pp for non-members – BOOK NOW! 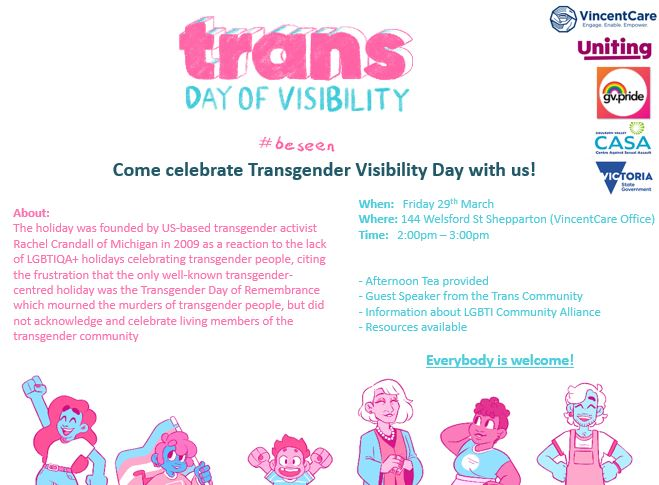 Contact Georgie via president@gvpride.org or 0401168229 to lock in your seat – MUST confirm your seat NOW! Cash payment MUST be received BEFORE boarding the bus by Fri 25 Jan.
Come and join over 100 groups and individuals as we march down Fitzroy St in St Kilda. All the colour and excitement you have come to expect from Pride March Victoria with the added flavour this special celebration. See the original marchers lead us out again and celebrate our first timers. Give generously this Nov/Dec – volunteer! 2 volunteers required for 3hrs per shift to sit out front John Anderson Amcal Pharmacy (Wyndham Street) to hand out FREE red ribbons, lapel pins, magnets, notepads, enviro bags and more to raise awareness around HIV/AIDS – this year’s national and international campaigns are “know your status” and “HIV still matters”. Please contact Damien on 0418 511 562 to register your interest. More info on Facebook. 4 volunteers required for 3.5hrs per shift to cook sausages/onions, serve food to customers (note: onions must be under the sausage, haha), handle cash, adhere to food safety practices, sell soft-drinks – this will occur on Wednesday 12 Dec at the NEW Bunnings, Benalla Road, Shepparton. Please contact Damien on 0418 511 562 to register your interest. More info on Facebook. 2 volunteers required for 3hrs per shift to sit out front Shop 4 / 224 Maude Street Mall (entrance to Tower Arcade) to gift-wrap Christmas presents for general public wishing to make gold coin donations per gift. Please contact Georgie on 0401 168 229 to register your interest. More info on Facebook. Unable to give your time? Prefer to donate? Thank you. Join us for 11 events over 4 days this Nov 1 – 4 @ OUTintheOPEN Festival! Please register here. Download PDF flyer here. We, the current committee, have been at it for 12 months! Now the time has come to ‘have your say’ in who runs the show! We encourage you ALL to attend, and to vote, and to use this opportunity – tell us what you want and how we can serve you better! Notice is hereby given that the Annual General Meeting of members of Goulburn Valley Pride Incorporated will be held on Sunday afternoon, Aug 26 @ 12.30pm, Rural Health Academic Centre, Conference Room 1 – Melbourne Medical School, 49 Graham St, Shepparton. Business: Welcome, Apologies, President’s Report, Financial Report (17/18), Set M/ship Fees (18/19), Election of office bearers for committees and sub-committees, General Business. We look forward to seeing you there! P.S. You are invited to join us earlier for brunch @ Lemon Tree Cafe from 10.30am – meals at restaurant prices. Thought about becoming a member (only $18/yr)? 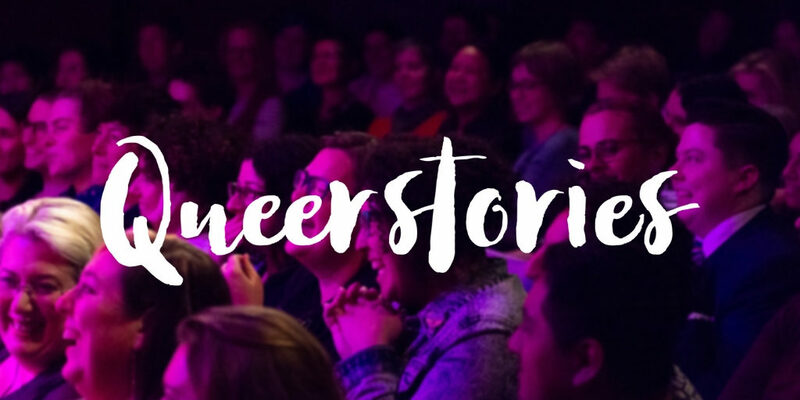 We’d love to have you on board (and you need to be a financial member to be on the committee). Nomination form can be found here. 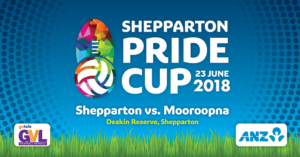 On Saturday 23 June Shepparton and Mooroopna Football/Netball Clubs will battle it out at Deakin Reserve for the region’s inaugural Pride Cup. A family day for locals and visitors alike including food, stalls and football/netball will see rival teams compete for the Pride Cup. Pride Cup celebrates diversity and inclusion in sport for the lesbian, gay, transgender, bisexual and intersex (LGBTI) communities by tackling homophobia in Australian Rules Football. What started out in 2014 as a celebration match between traditional rivals Yarra Glen and Yarra Junction has turned into a strong symbol for inclusion in Australia’s favourite sport right across Victoria. 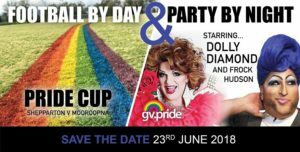 Now there are a range of Pride Cup games that are held throughout the state, including Shepparton. Pride Cup was also the inspiration for the AFL Pride match. 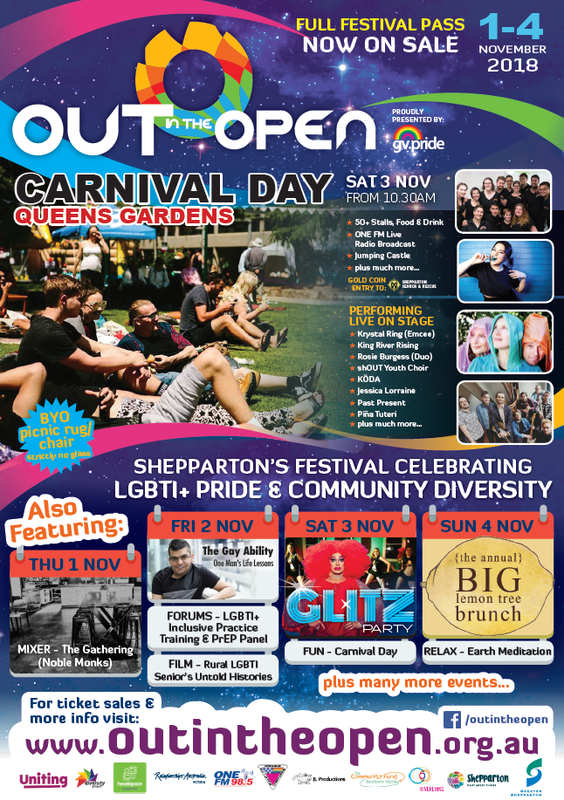 Shepparton’s Pride Cup is proudly supported by Shepparton Football Netball Club, Goulburn Valley Pride Inc., ANZ Shepparton and Greater Shepparton’s LGBTI+ Community Alliance.